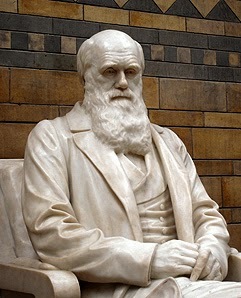 Today is “Darwin Day” — the anniversary of the great naturalist Charles Darwin’s birth in 1809 — which is as good a time as any to reflect on the complicated ways in which Darwinian thinking influences the transhumanists. 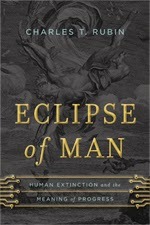 This is discussed at several points in Eclipse of Man, the new book by our Futurisms colleague Charles Rubin, which you should go out and buy today. Malthus’s original argument, there is something inevitable also about that acceleration, that we are driven by some force of nature beyond our control to grow until we reach beyond the capacities of the resources that support that growth. Meanwhile, mainstream Darwinian thinking has done everything it can to remove any taint of progress from the concept of evolution; evolution is simply change, and randomly instigated change at that. Transhumanism rebels against the randomness of evolution and the mindlessness of a natural tendency to overshoot resources and collapse. It rejects ... the “assumption of mediocrity” in favor of arguing that man has a special place in the scheme of things. But its rebellion is not half as radical as it assumes, for transhumanism builds on the very same underlying conception of nature that the Malthusians and Darwinians build on, vociferously rejecting the thought that nature has any inherent normative goals or purposes. While it rejects blind evolution as a future fate for man, it accepts it as the origins of man. While it rejects a Malthusian future, it does so with threatening the same old apocalypse if we do not transcend ourselves, and, in the form of Kurzweil’s law of accelerating returns, it adopts a Malthusian sense that mankind is in the grip of forces beyond its control. Because transhumanism accepts this account of nature, it is driven to reject nature. Rejecting also any religious foundations for values, then, it is left with nothing but socially constructed norms developed in response to human power over nature, which, given the unpredictable transformative expectations they have for that power as it becomes not-human, ultimately amounts to nothing at all. Transhumanism is a nihilistic response to the nihilism of the Malthusians and Darwinians. 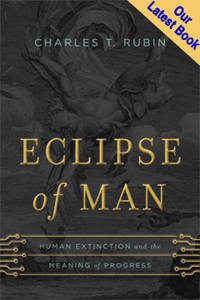 You can see why Peter Lawler says Eclipse of Man is a “hugely significant accomplishment”: you simply won’t find as insightful, thoughtful, and trenchant a critique of transhumanism anywhere else. I think transhumanism has actually made evolution into a mother-goddess and the source of a moral order given from outside the human community. I've called this a pre-Copernican worldview (in which the universe itself is structured as a moral order) although it is also like that of any religion in which The Law is supposedly handed down from a deity. Thus, I disagree with the view of transhumanism as "vociferously rejecting the thought that nature has any inherent normative goals or purposes", and instead embracing "socially constructed norms." Rather, I see the transhumanists as dissatisfied with socially-constructed norms centered on humanity, and appealing to (their conception of) nature as the source of inherent normative goals and purposes - Evolve! Grow! Get smarter! Or at least "more intelligent." I agree that transhumanism assigns us a special position among the world's creatures, but this position is special only in that it is a link to the next link in the great story of evolution; thus, from the long view of history, humanity's role will appear rather small, not much greater than that of any of our ancestor species. I don't see transhumanism as nihilistic so much as a desperate flight from the nihilism that results from viewing the truths uncovered by science, which nullify the claimed sources of meaning, as a nullification of meaning itself. I think we have to accept that the universe is a moral void. But we are our own source of meaning - collectively, not individually, as the lonely discover. We have managed to create, collectively, the foundations (at least) of a moral order that we should protect for our own sake and for our children, and not because God or Goddess told us to, not because there is some mathematical proof of its correctness, not because it is part of some great story, nor for any other reason given from outside, but simply as an act of affirmative will - and because we have seen the alternatives. Mark: Thanks for a typically thought-provoking response. To the extent we disagree it may be because I am less certain than you that “we have to accept that the universe is a moral void,” and that our collective meanings are best understood as “an act of affirmative will.” As these are matters upon which whole treatises could be written — and not by me in any case — I will rest content with merely stating what I take to be the disagreement. In practice, I don’t know whether in fact any transhumanists would agree with you, but I am not sure why they couldn’t — but for a possible reservation about collective versus individual meaning. And even that reservation might be overcome by the following formulation: As a species we can choose to maximize our abilities through following diverse paths of development. We therefore affirm, in the absence of all natural constraints, that our collective purpose is to use modern science and technology to evolve, each as best he can by his own lights, with the expectation that the best of these experiments will triumph.